World renowned sousaphone virtuoso Kirk Joseph is a jazz sousaphone player from New Orleans, Louisiana. The son of trombonist Waldren “Frog” Joseph, Kirk Joseph began playing the sousaphone while a student at Andrew Bell Middle School, and took part in his first professional gig at the age of fifteen when his brother Charles invited him to play a funeral with the Majestic Band. 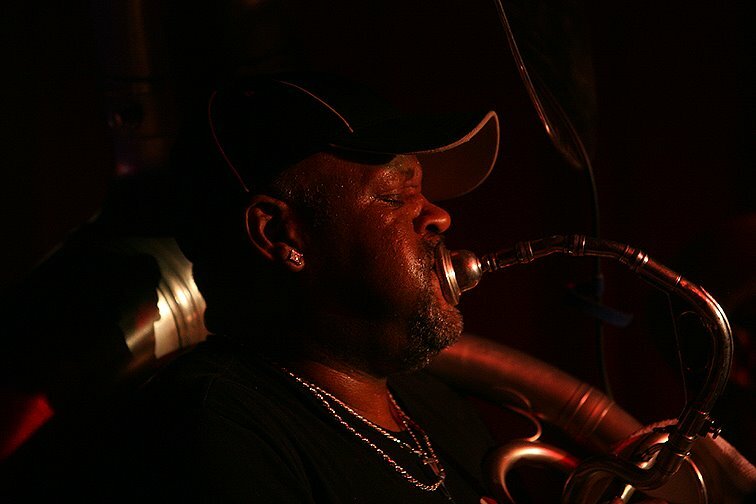 In 1977 he became one of the founding members of the Dirty Dozen Brass Band, a group which is credited with reviving the brass band tradition in New Orleans. He has played with the Treme Brass Band and Forgotten Souls Brass Band, and currently leads his own group called Kirk Joseph’s Backyard Groove. Described as a “modern sousaphone pioneer,” Joseph claims inspiration from renowned New Orleans tuba player Anthony “Tuba Fats” Lacen. In an interview with The Times-Picayune Joseph described the effect Lacen’s playing had on his own: “He was the first person I ever heard walking the sousaphone, making it sound like bass…. I took it from there.” The style of playing created by Lacen and Joseph was instrumental in establishing the modern New Orleans brass band sound, which combines traditional marching band and Dixieland traditions with strong jazz and funk influences. Kirk Joseph has earned his seat at the table of New Orleans’ greatest musicians and will surely claim his place in music history as perhaps the greatest innovator of his instrument, the sousaphone. For most, a mention of the sousaphone conjures images of marching bands and drum cadences. But in the hands of Joseph, the instrument comes to life in ways that its namesake, John Phillip Sousa, could have hardly imagined. During his long tenure with the Dirty Dozen Brass Band, Joseph developed his innovative approach to the sousaphone, replacing the instruments limits, as perceived by his predecessors, with a rich musical vocabulary. Never before had such a creative and stylistic range been demonstrated. But the new standards set by Kirk Joseph have prompted many since to follow his lead. In between performances and recording sessions with Anders Osborn and a host of other locally, nationally, and internationally known artists, Joseph began working on his own material in collaboration with some of New Orleans most talented musicians. The result comes together as the Backyard Groove, an assemblage featuring Kevin O’Day, on drums, Chris Mule and Hiro Mano on guitars, “Sheik” Rasheed Akbar and Eric Traub saxophones, Raymond Anthony Williams on trumpet and a variety of special guests including “Mac” Rebennack, aka Dr. John. The music is a tight, rhythmic and high-spirited concoction of jazz, funk, and afro-caribbean flavors that’s been proven to have a wide appeal.